Before I became a professional pet sitter my dream was to be in the political arena, because I wanted to make positive changes to our world. I attended Francis Marion University from 1994-1998, majoring in Political Science and minoring in English, professional writing to be exact. After college my Beagle Molly and I moved to the big city so I could pursue my dream of becoming a political speechwriter. I got my first job as a paralegal, which I worked hard at for a long 10 years. From this experience I came to realize that a 9 to 5 desk job was not for me. Molly and I made our way back home just before my father passed away in 2003. Molly truly saved me from the overwhelming grief from this great loss and I realized then that my ultimate debt is to animals. This spurred me to take a leap of faith working for a kennel. For my 7 years at the kennel,I learned about animals and their behavior traits. During this time, I also became committed to helping place animals in forever homes once the owner died. 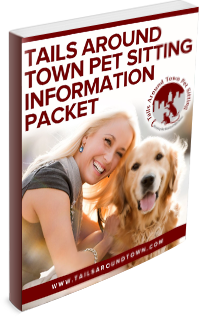 In 2011 I was ready to use the skills and foundations I had built from these experiences to start on my very own pet sitting business, Tails Around Town!I have also obtained a license for massage therapy, which I will use to further help my furry pals. Sadly I lost my beloved Molly at the age 18. I hold such a deep love for her and owe her so much that I have made it my mission to help others give their pets the very best life they can by providing top-notch professional pet care. I have learned so much about myselfthrough animals. I will continue to use this platform to make my changes in the world.